As might be expected, our proximity to Lake Erie, Lake St. Clair and the Detroit River attracts several species of Gulls. The marshy areas along the lakes and rivers in the area also attract Wading Birds, who rest and feed there. Avocets are large, wading shorebirds. Though rarely spotted, the American Avocet has been seen in SE Michigan. Bitterns are small-or-medium sized birds with brownish plumage and often found in marshes. They have a loud cry. Species seen in SE Michigan include American and Least Bitterns. Cranes are tall wading birds. 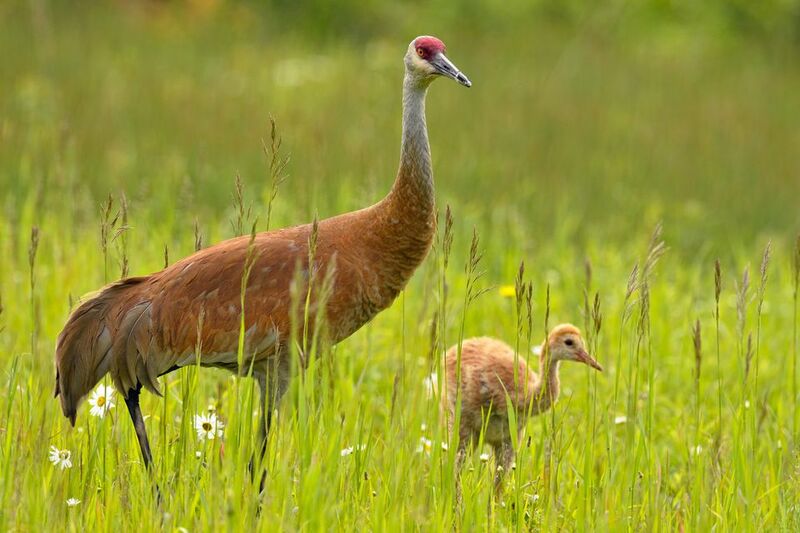 Species seen in SE Michigan include the Sandhill Crane. Gulls have long wings, webbed feet, and a hooked beak. They are typically grey or white. They eat fish and forage for food on beaches. Species seen in SE Michigan include Ring-Billed, Herring, and Less Black-Backed Gulls. The Laughing Gull has also been spotted in the area. Herons have long necks and legs, as well as pointed bills. They are often white or gray and found in marshes. Species seen in SE Michigan include Yellow-Crowned Night, Great Blue and Black-Crowned Herons, as well as Egrets. Phalaropes are small shorebirds that are similar to Sandpipers. Species seen in SE Michigan include Wilson's, Red-Necked and Red Phalaropes. Plovers are small shorebirds with long wings. Species seen in SE Michigan include the Kildeer, as well as Black-Bellied and Semipalmated Plover. Rails are typically found wading in marshes and are somewhat chicken shaped. They are small-to-medium sized with short wings and tails. They have long toes for running in the mud. Species seen in SE Michigan include the King and Virginia Rail, as well as Sore and Common Moorhen. Sandpipers are small wading birds with long, straight bills to probe sand and eat insects. Species seen in SE Michigan include Solitary, Spotted and Western Sandpipers. Terns are smaller than gulls and have forked tails. Species seen in SE Michigan include Foster's, Caspian, and sometimes Gull-Billed Terns, as well as the Common Tern, a Michigan-threatened species. Waterfowl are also plentiful. In fact, 27 species have been recorded along the Detroit River corridor alone. In addition to abundant water for swimming, waterfowl – Ducks, Geese, Swans, Loons, Scaup -- are attracted to wild celery that grows in the area and power-plant-warmed water along the shore. Duck species seen in Michigan include Canvasbacks, Redheads, and Wood Ducks, as well as diving Greater and Lesser Scaup. Geese are large waterfowl. Species seen in SE Michigan include Greater White-Fronted, Snow and Canadian Geese. Loons are graceful and delicate in water but awkward on land. They dive for fish and have a distinct cry that can sound mournful or laugh like. Species seen in SE Michigan include the Red-Throated and Common Loon. Swans have large bodies, webbed feet, and long necks. Species seen in SE Michigan include Mute, Trumpeter, and Tundra Swans. Perhaps most surprising for the area is the abundance of birds of prey or raptors that migrate through the area, including hawks, falcons, vultures, and eagles. This is a result of the unique geography around Lake St. Clair and Lake Erie that cause a migratory corridor along both the eastern and western shores of the lakes and along the Detroit River that connects them. Vultures are large, soaring scavengers with featherless heads. They often have dark plumage. Both Black and Turkey Vultures have been seen in Southeast Michigan. Falcons have powerful wings for swift flight and short, curved beaks. Species seen in SE Michigan include American and Peregrine Falcons, as well as the American Kestrel and sometimes Prairie Falcons. Eagles are large, soaring birds. Species seen in SE Michigan include Bald, Golden and White-Tailed Eagles. Hawks hunt by day and have powerful wings and eyesight. Species seen in SE Michigan include small, slender forest hawks like Broad-Wing, Cooper's Hawk and Sharp-Shinned Hawks, as well as larger hawks like the Red-Tailed Hawk. Osprey hunt fish and have long, gull-like wings and a white head. Owls are nocturnal and have excellent vision and hearing. Species seen in SE Michigan include Eastern Screech, Great Horned, and Snowy Owls. Warblers – Metro Beach Metropark has counted 37 species of Warblers. Warblers are seen in SE Michigan, including Blue-Winged, Yellow and Kirtland's Warblers. In addition to these broad categories of birds, SE Michigan has played host to many, many other types and species. For instance, given our large wooded areas, Woodpeckers are a given. Hummingbirds and the nocturnal Goatsucker, however, may be less expected. Although the label “Cuckoo” is often associated with a tropical bird, the Yellow-Billed Cuckoo actually breeds in the area.